Short Fiction Monday: Our weekly exploration of free and inexpensive short fiction available on the internet. Here are a few stories we’ve read that we wanted you to know about, including three 2018 Nebula nominees. 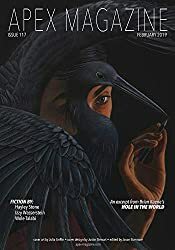 “A Witch’s Guide to Escape: A Practical Compendium of Portal Fantasies” by Alix E. Harrow (2018, free at Apex magazine, $2.99 Kindle magazine issue). 2018 Nebula nominee (short story). Our narrator is both a librarian and a witch (all good librarians are, she claims), and one of her joys is giving library patrons the book they “need most.” So when the black teenager with the red backpack comes into the Maysville Public Library, located somewhere in the deep South, and latches onto a portal fantasy, she breathes him in and can tell he’s deeply, howlingly yearning for a way to escape this world and never come back. God save me from the yearners. The insatiable, the inconsolable, the ones who chafe and claw against the edges of the world. No book can save them. So she feeds him a series of magical fantasies, knowing that’s not enough to truly help him. He needs a book that’s not just about magic, but a book that is magic. But sharing those types of books with library patrons is strictly forbidden. I loved the librarian/witch narrator’s voice and dry sense of humor. The details in this story are delicious. I have a major soft spot for library-themed fantasy, and Alix E. Harrow’s love for books and reading shines through in this imaginative tale, where books jostle on the shelves to try to attract the attention of readers, and a book that is returned with “the flashlight-smell of 3:00 a.m. on its final chapter [is] unbearably smug about it.” At the same time, you also feel the heartbreak and hopelessness this teenager feels in the foster care system. 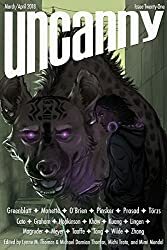 “And Yet” by A.T. Greenblatt (2018, free at Uncanny, $3.99 Kindle magazine issue). 2018 Nebula nominee (short story). “And Yet” is a 2018 Nebula Award finalist in the short story category, and it’s easy to see why. It’s a story told in the second person, where you find out that you are an up-and-coming theoretical physicist with a surprising inspiration for your work. Only idiots go back to the haunted houses of their childhood. And yet. As they’ve done many times during the course of their relationship, a couple once again “rolls back,” which means diving into a shared past memory using their “FreezeFeel data,” though their perspective on the experience isn’t as commonly felt as the memory itself. 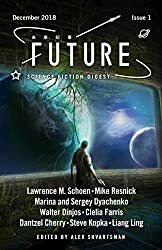 The Rule of Three by Lawrence M. Schoen (2018, free in Future Science Fiction Digest, Dec. 2018, $3.99 Kindle magazine issue). 2018 Nebula nominee (novelette). The narrator, an employee of the U.S. state department, is passed a message from his Miao (Hmong) grandmother, who lives in a small, mountainous village in China: “a funny-looking fellow fell from the sky in a giant pearl and was teaching the village’s children odd things.” No one outside of the village is aware of the alien visitor. Alarmed, he rushes across the world to his grandmother’s village to find out what is happening and whether his grandmother is in danger. Less understandably, he fails to tell anyone at the state department where he’s going and what he’s heard. Once he gets to the village and recuperates from his jet lag and a major bout of food poisoning, he meets the alien, named Foom. Foom is literally unable to see clearly anyone who is immersed in modern technology, whether it be carrying a cell phone, eating processed food, or wearing store-bought clothing. Foom calls these things “unlife,” and requires the narrator to put aside all these artificial trappings of technology and modern society in order to learn from him. Most especially, the narrator learns that he must respect the Rule of Three: you must be no more than three people removed from the one who originally made the food, clothing, method of transportation or anything else. The primitive Chinese village Foom is visiting was one of the few places on earth where he could perceive humans. All technologically advanced societies are dark to him. SKYE WALKER, who has been on FanLit’s staff since September 2014 (after a brief time on staff as a YA reviewer in 2007-2008), is from Canada. Their HBA in Anthropology and Communications allowed them to write an Honours paper on podcasting as the modern oral tradition of storytelling: something they will talk about at any and all opportunities. Skye is a communications professional in the non-profit sector. These days their favourite authors include Ursula K Le Guin, Bo Bolander, and Chris Wooding. They can be found on social media @cskyewalker. @Tadiana, I love the Rule of Three for food because I live in a thriving agricultural area with half a dozen great farmers markets in easy distance. I can get and have gotten all my food from fewer than 3 steps… for a few days. After that it gets dicey. (Flour, cooking oil, etc.) Interesting idea, but he seems to have pushed it past its limit. I do think the food part of the Rule of Three is great if you live somewhere where it’s feasible. It reminded me of Barbara Kingsolver’s Animal, Vegetable, Miracle – an interesting book about her family’s year of eating local foods only. In the story, the practical difficulties with the Rule of Three were resolved to some extent by using Mind Powers that the alien was able to teach some humans. Creating a spaceship with your mental powers, basically. That would certainly make it easier!